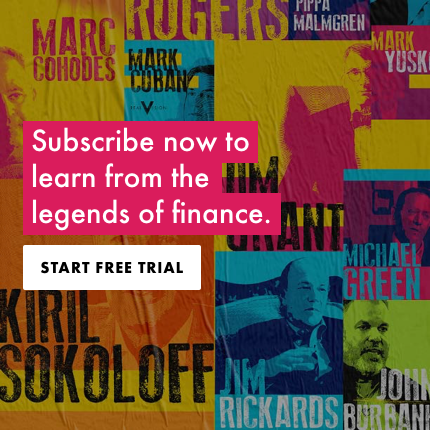 Dan Rasmussen joins legendary financial reporter Jim Grant to discuss the state of equity markets, discrepancies between practice and theory, and his chronic contrarianism. Listed on Forbes’ 2017 “30 under 30” list, Rasmussen also shares his philosophy on how to find value in today’s world. Filmed on May 30, 2018 in New York. His top pick, Ahresty (5852) is seemingly cheap on EBITDAx but it looks expensive on FCF. In this type of business, capex is always too high and hard to generate free cashflow. This discussion should have been made in 3 persons with Jonathan Tepper from Variant Perceptions who wrote a book Myth of capitalism. It looks Jonathan has a very different view to monopoly pricing power than Dan!... could be a way more interesting discussion. Very good and interesting. Thanks a lot! Dan is wrong about Moats. Morningstar’s moat select index has outperformed. His strategy is nothing new & if he’s using leverage he better have the same back aches as Soros or his prime will decide his fate in a drawdown. Slightly annoying that Jim speaks at least 2x as much as his interviewees and frequently interrupts. Sure, Grant is brilliant but I would appreciate if he could let his equally brilliant guests finish their sentences themselves. Incredible interview of very intelligent guy, interviewed by another very intelligent guy. Excellent and substantive. No cliches and no wonk speak but real thought! Excellent interview. It’s refreshing to hear a guest speak about empirical analysis for a basis of developing a strategy. And wise beyond his years. I am 6 years older, but not as bright as him. Nonetheless, have managed to reach similar conclusions about investing and life. ...of modern portfolio theory and accepted investing practices. Simply fantastic. Please have Dan back - we all stand to learn a great deal from him, I reckon. Very talented guy. Jim is a better interviewee than interviewer. There, I said it. It needed to be said. Dan is fantastic. His podcast interviews with Meb Faber and Patrick O'shaughnessy are off the charts. That was good stuff. One can distill quite a lot from it. A disciple of Phil Tetlock's Superforecaster in action, so to speak. Terrific interview. It was a pleasure listening to two erudite individuals discussing the value (or lack thereof) of advisors, economists, academicians, and other self-appointed "experts". I've enjoyed every one of Jim Grant's interviews. Please bring him back after this series. Ditto for Dan Rasmussen. It would be great to hear what other underpriced opportunities/sectors he has uncovered. Great interview. Loved how straight talking Dan was for the duration - to me he came across as an extremely bright chap that I’d love to hear more from again. Dan was a delightful and articulate guest. I liked his views on life as well as investing. If anyone is looking, the Japanese auto supplier is called AHRESTY CORPORATION, ticker is TYO: 5852.
regardless of if you agree or disagree with Dan Rasmussen this type of interview is clearly one of the reasons one subscribes to RealVision..out of the box,contrarian and something you will unlikely be exposed too on conventional business programs. Would like to have had Dan comment on the whole idea of correlation between securities,asset classes and markets. WOW! Most enjoyable. Please keep them coming. Was it Einstein who said: Embrace the class disruptor, for they are ones to change and run the world. Question what you learn and learn some more. I think the take-a-way of this well done interview is just that---challenge everything including yourself. Grant does need to let the guest finish answering his questions before interrupting. Grant's sense of humor is refreshing. The world has really changed over the last 10 years and Dan R., will be a very important mentor to many. Great interview! Brilliant guy! Really wish Jim grant would ask shorter questions. I wouldnt be suprised if the talking time is divided 50/50 when actually what we want is to hear THE GUEST. Jim: Watch Larry King interview people on RT, no question is longer than 5-10 words. Your questions take half an hour for your to get through! Taimoor, normally I would agree with you on how an interviewer ought to divide time, but this is Jim f...... Grant. What you want is to let his mind loose and speak as much as possible. These JG interviews aren't your run of the mill kind so you want them to breathe freely. More matter with less art please! The benefit of having an hour to talk is supposed to be an ability to drill down on some interesting ideas. This just seemed to be 55 minutes of skating over the surface of those ideas. Wasn't sure what to expect, but great insights! Well done! Very frustrating & irritating listen to Jim's constant interruptions just like the bad TV talking heads. Interviewers who think its all about them should not be on RVTV. Usually has something pertinent to say when interrupting so I don’t have an issue with that. A keen student of history so glad to hear from Jim in terms of that knowledge instead of being stuck just asking questions. While I am sure most of your opinions are well founded - this one is not. I like Dan. Thoughtful and well spoken. Good interview. Found Dan stoic and admirable, definitely a Ray Dalio scion talking about living according to his principles and values. Enjoyed his explanation of his approach and furthermore his talk of experts- something from cultural geography 101. Ever appreciative of the interchange between two strong minds, I found this interview thought provoking and challenging of the status quo. Jim Grant smiling and calling Dan somewhat of a subversive character. This might be my favorite Jim Grant interview yet. Awesome! I am glad to see someone at his age and learning thinking critically about what he has experienced and making appropriate questions. Not too sure if I can agree with him about finding "high quality" business w/ appropriate debt and value in the public market since most things are so overvalued today. But I'm sure there are always some arbitrage to be made. A great interview and some refreshing perspectives and ideas. Thank you both. Great conversation as always from Jim, however would have loved to see Dan's ideas explored further. Yes, he disagrees with most of modern finance and valuation techniques, but I'm not clear on how Dan actually goes about valuation. How does he determine under/over valuation, when to buy/sell as he mentioned buying stocks at 2-4x EBITDA but is it simply a gut feel that these stocks are cheap and at what stage would he consider selling? Going through Dan's investment process in more detail would have made this much more valuable. Dan, Dan, Dan...you are talking to a legend so please...have a little respect. Besides....Jim's interruptions are at least as good as the answers he interrupts. There is little in this interview that is new/progressive thinking. At best it's a data analytics assisted spin on traditional PE to find a replicable scenario in other markets, and certainly nothing actionable to the common subscriber. Bring back more Michael Green, Daniel Want, Jeff Snider, Brett Johnson, and Grant Williams. I am 26 years old and can say that the recent RV shift has not been for the better. The quality over the past 1YR/1.5YR has really deteriorated. I understand the "black knight" rhetoric towards Grant, started by Hugh, that perhaps propogated Grants retraction from the star interviewer, but the content in such interviews was something distinct, defensible, intelligent, that made sense. At the very least, Grant should carry an interviewee position on the platform, the same way Pal does. Are you a Harvard grad. He's of course right that private equity/venture is mostly a function of vintage/pricing. There are certainly some value-added managers who are worth investing in, though right now pretty much every asset class is frothy. There are some real issues with specific sectors such as real estate private equity. It is very hard to time cycles especially with a ten year life, long-only fund... not being able to hedge in a highly-leveraged asset class. Most real estate fund managers don't add a ton of value, so returns are made on the buy or on good timing of new development projects. I am sorry, Dan. You are articulate but there is nothing new in what you are trying to do. Those companies are cheap for good reasons. The examples you gave during the interview are neither growth businesses nor disruptive technologies. They are loaded with debt and they should continue to remain cheap. Perhaps they get cheaper. I have heard this story before many times. I’m sorry Jim, it’s going to take more than a couple beers to get that admission. Maybe a couple joints to get them paranoid first. Dan's criticisms of DCF are hardly new. Bruce Greenwald covered these and much more in his excellent 'Value Investing' of 2001. But to then blithely discuss scoring of companies on P/ EBITDA and that this reflects market valuations is too simple. He needed to talk in the same breath of P/ Book and conservative projections of ROE. His way of viewing markets and the world pokes holes into so many of today's business models. The idea of macro research specifically comes to mind. "if you have nothing to say, make sure you do not say it clearly" The premise behind so many of these models is to take advantage of humans affinity for stories and storytelling. I guess someone needs to question this guy, why not me. Everyone likes an independent thinker who throws shade on the current market gurus. Dan suggests that Buffett's focus on moats and barriers to entry are based on "useless speculative theory"...that makes no sense looking at the evidence. Buffett has made $88.2bn (market value, subject to change) and I assume Dan less than $1bn (and I'm being generous). I believe Dan is confusing Michael Porter's theories on competitive advantage/barriers to entry with Buffett's focus on consumer brainwashing/pricing power/reinvestment opportunities. Utilities, Telecoms have created little value for shareholders but work under Micheal Porter's theories. Note that Michael Porter had a consultant firm that went bankrupt because he went around preaching the benefits of his unproven theories! I believe Buffett is focused on companies that offer something intangible to consumers, hard to replicate and generate cash that can be reinvested at similar returns. Gieco, ABC/Capital Cities, Wells Fargo, Wal-Mart, Amex....are some of Warren's greatest investments and all operated in competitive industries. I have a lot to learn and so does Dan. I really enjoyed this discussion. The private equity part reveals the difference between risk and volatility. The mismatch in structures that price monthly NAVs and hold relatively illiquid assets is most problematic at turning points in credit markets. That's when the NAVs tend to overstate the prices at which the underlying assets can clear. Last one out is a rotten egg. Rasmussen is so quotable -- "[we define] quality as that characteristic of not going bankrupt" and "[that] general den of bad ideas, which is the business schools." "People would far prefer to not deal with volatile things than to deal with volatile things, even if the volatile things go up more." Is that why the VIX was below 9 so often last year? Another winner from RV. If I had two thumbs I would have had one pointing up and one pointing down. Mr. Rasmussen is clearly a brilliant mind. It is most unfortunate that Mr. Grant did not allow the space for more insight into Mr. Rasmussen's thinking. At 28:55 as one example he cuts off Mr. Rasmussen as he enthusiastically starts a sentence. It is never a good sign when the interviewer speaks as much as the guest or what felt like even more. To be fair, I did not time this. Thanks all the same to RV for bringing Mr. Rasmussen to our attention. I will certainly look into his work. Have to agree with you here. I love Jim Grant but I wish he would let his interviewees express their views more without guidance at every step. I can understand directing the interview but I feel that directing the answers is a detriment to the viewer. And while I really enjoy Jim Grant’s humor and anecdotes, I do wish he would moderate his numerous interjections a bit, especially when it comes at a time which interrupts the interviewees train of thought or derails the question. Yea I totally understand your perspective, but for my own opinion I love hearing what Jim Grant has to say just as much as the guest. All of us love Jim Grant. His experience with observing the markets and writing about them is almost unequaled and his dry wit is priceless... but yes, Jim needs to allow his guests speak. If anyone at RV reads these comments, please send Milton over to have a chat with Jim about not interrupting. I've said this about all of his interviews. I’m with David & Michael on this.